I left my hotel and went west on I-80 to New Jersey Exit 1. From there I went north one mile on Old Mine Road to the Fairview trailhead parking lot. From there I would hike the Beulahland trail 1.4 miles to Holly Springs. Just past Holly Springs the trail ends at Dunnfield Creek. 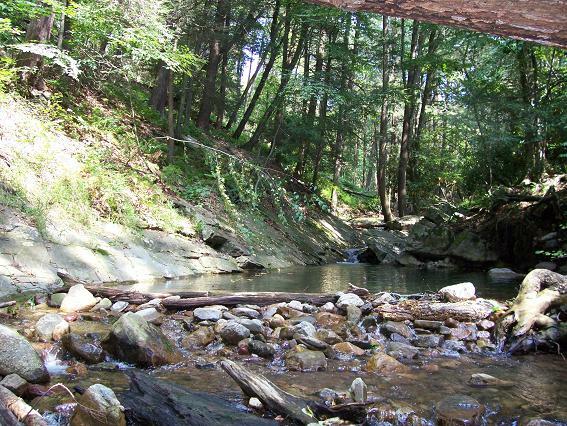 I wanted to try some "survival" fishing, so I put on my sandals and walked downstream (yes, in the water), paralleling the Dunnfield Hollow trail (green blazes), fishing as I walked. I rejoined the green trail just above the Blue Trail (Mt. Tammany) junction. I then continued southbound on the green trail to the AT, to I-80. My map showed a short trail called the Karamac trail which paralleled the Old Mine Road and would take me back to my car. But I do not recommend this, as I actually had to walk on the grass adjacent to I-80 for about a third of a mile. 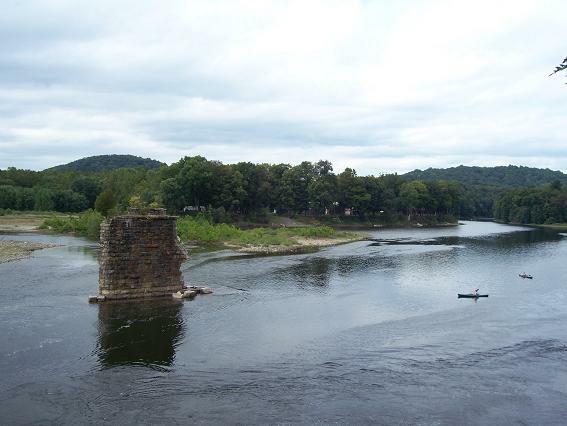 The Karamac trail is 1.2 miles long, and is between the Delaware River and Old Mine Road. Nothing spectacular, except the old railroad(?) bridge is pretty cool, and from which you have some nice views of the river and the kayakers. Total distance was about five miles. Go here for a map of trails in the area. 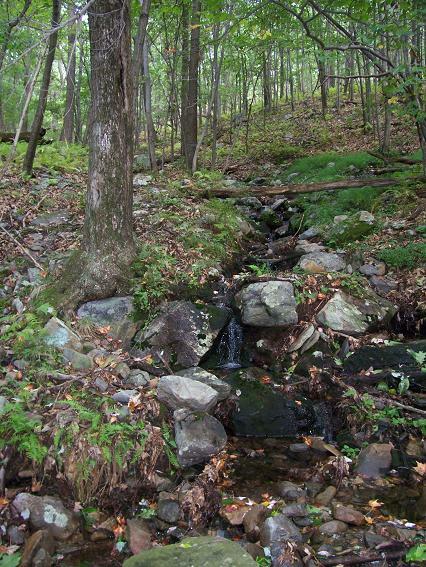 This is Holly Springs, which is immediately off the trail, between the AT and Dunnfield Creek. I wanted to do some fishing. 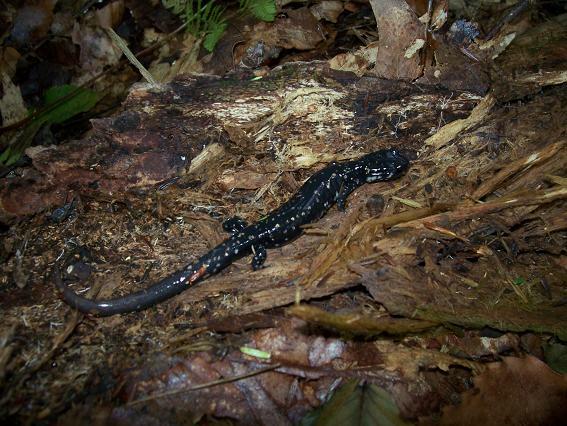 As I was turning over logs looking for worms, I saw a lot of salamanders. This one is about five inches long. I had marginal success at fishing (which for me is above average!) Afterall, I was using a stick for a pole, a short length of line, a hook, bobber and worms. Two little guys got away, before I realized I needed to give them more time to set the hook. 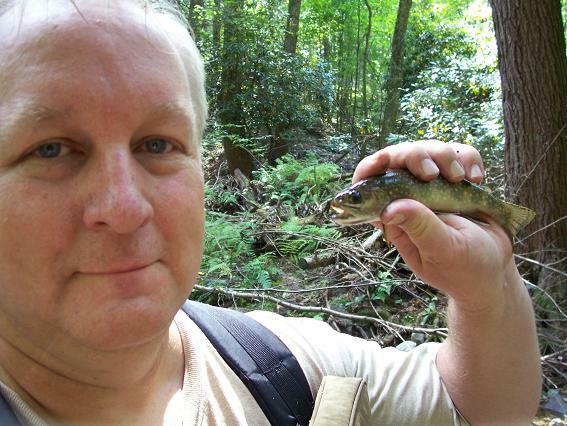 I caught this guy and two smaller ones. 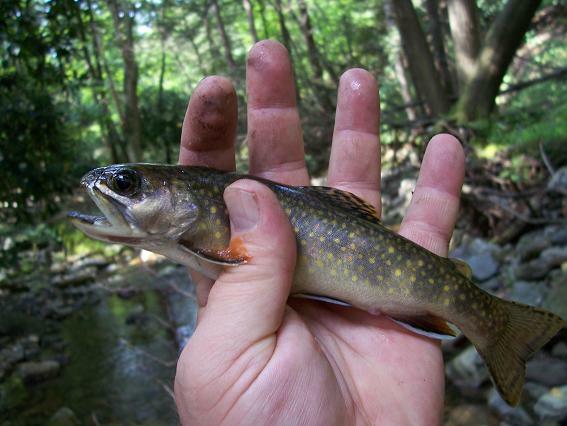 The coloring on these brook trout is gorgeous. I didn't keep the fish. I just wanted to see if I could catch some. I was literally hiking in the creek. 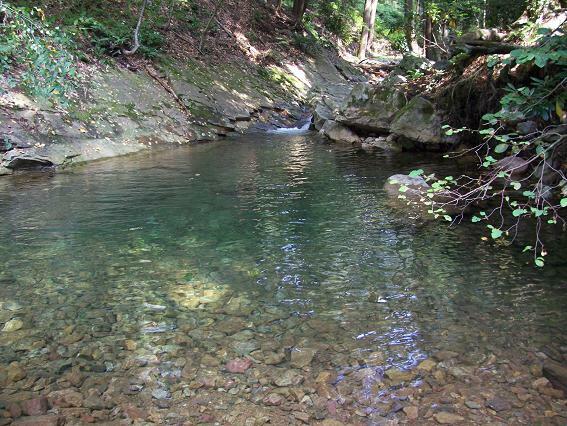 I found this beautiful swimming hole. I doubt it is used very often as it is some distance from the trail. This is the old railroad(?) bridge about 1/4 mile below Fairview trailhead parking lot. Copyright © 2006 by Bill Qualls. Visit my home page at http://www.billqualls.com.